We’re interviewing the Makers you’ll meet at at Maker Fest 2019 on Saturday, February 23 so you can get to know them ahead of time! Returning to Maker Fest for their second year is the group the North Star Scrollers! If reading about the North Star Scrollers’ work has inspired you to share your own, sign up here to be a Maker yourself! What (or who) inspires you to make? 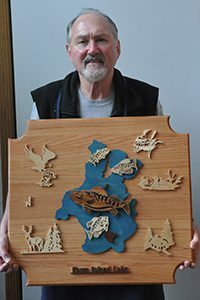 The challenge of making wood projects with detailed cuts and seeing the joy it brings to a person when you give one as a gift. What do you enjoy making? Project types include: desk plaques with name/company, veterans, religious themes, occupations, pets, fish, etc. What are your favorite materials and mediums? If you could make anything imaginable with no restrictions, what would you make? Complex original logos of the military branches. What music do you listen to while you work? How has the MPA Makerspace impacted your abilities? Provides an opportunity to share your talent with others and to inspire youth to become interested in woodworking, such as scroll sawing.